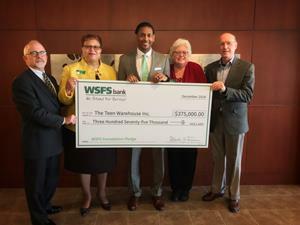 WILMINGTON, Del., Jan. 30, 2019 (GLOBE NEWSWIRE) -- The WSFS Foundation, the philanthropic arm of WSFS Financial Corporation (Nasdaq: WSFS) and its primary subsidiary, WSFS Bank, has awarded a total of $425,000 to three community programs and organizations that are achieving academic, economic and positive life outcomes for youth in Wilmington, Del. Vernita Dorsey, WSFS’ Senior Vice President and Director of Community Strategy, and Theresa Hasson, Vice President and WSFS’ Director of Community Reinvestment, joined nonprofit community partners from The Teen Warehouse, the Delaware Restaurant Association Educational Foundation and Year Up Wilmington at WSFS Bank’s headquarters in Wilmington where the WSFS Foundation grants were presented. Vernita Dorsey, WSFS’ Senior Vice President and Director of Community Strategy, and Theresa Hasson, Vice President and WSFS’ Director of Community Reinvestment, presented the $375,000 grant to nonprofit community partners from The Teen Warehouse. Vernita Dorsey, WSFS’ Senior Vice President and Director of Community Strategy, M. Scott Baylis, Senior Vice President and Business Banking Manager, and Theresa Hasson, Vice President and WSFS’ Director of Community Reinvestment, presented the $25,000 grant to representatives from the Delaware Restaurant Association Educational Foundation, which operates the Delaware ProStart Program. 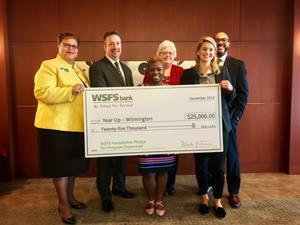 Vernita Dorsey, WSFS’ Senior Vice President and Director of Community Strategy, and Theresa Hasson, Vice President and WSFS’ Director of Community Reinvestment, presented the $25,000 grant to community partners from Year Up Wilmington. The Teen Warehouse is a planned community center for teenage youth that is already under development in the Riverside neighborhood of Wilmington and is scheduled to open in September 2019. The center will be a safe place that Wilmington teens can visit after school to learn, play games and stay active. It will also support youth who are interested in creating works of arts, including stage plays, painting, dance and music. The $375,000 grant will be paid over five annual payments of $75,000, which will help fund The Teen Warehouse’s operating expenses. The center will include a library and reading room, a computer lab, a STEM (science, technology, engineering and math) lab, a gym, a health center and several multipurpose classrooms. The Teen Warehouse is spearheaded by a coalition of several nonprofit organizations that the WSFS Foundation and WSFS Bank have previously supported. The WSFS Foundation has awarded $25,000 to the Delaware ProStart Program by the Delaware Restaurant Association Educational Foundation. Delaware ProStart is a two-year industry-written curriculum that teaches high school students culinary and management skills needed for a career in the restaurant and food-service industry. The program has experienced increased and sustained growth year over year benefiting more than 3,000 under-privileged and under-served students from 18 high schools throughout Delaware. To help support the program’s ongoing success, this is the third consecutive year that the WSFS Foundation has made a grant to the Delaware ProStart Program. Year Up Wilmington is an intensive, one-year program for college students—ages 18-24—that combines professional coaching, hands-on skill development, and internships. Year Up Wilmington currently supports 80 college students enrolled at Wilmington University. 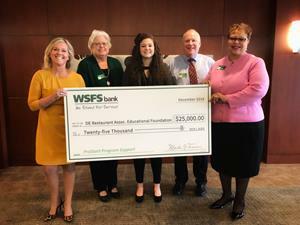 The organization plans to use the $25,000 grant from the WSFS Foundation to scale its program and double its enrollment to 160 students per year. To date, Year Up Wilmington’s curriculum and professional development programs have helped 85 percent of its students to gain meaningful employment after graduating from college.